Completely wireless music in your house is the future, and Sonos did it right first. We've been fond of the company for years because the system is painless to setup, easy to use, and reliable (not to mention the sound). Today, Sonos gets even simpler by killing the final wire between you and your music. Sonos setup is already very easy: Plug one component into your router, fire up the Sonos app on your computer or your phone, and you're guided through the process of adding speakers and creating groups for different rooms in your house. But that wired connection to your router remains a clunky piece of the otherwise seamless system. Sure, sometimes your router is conveniently located so you can just plug right in, but sometimes it's not. The company's Bridge exists basically exclusively so you can connect to a router that's across the house from where you want music. A few months ago, Sonos announced that it had developed software that would eliminate the need for that last pesky wire. After testing the new tech with thousands of users, the company will start rolling out a firmware update to devices today. Now, setup just requires power and a Wi-Fi connection. Fire up the app, and you'll be guided through the rest. And if you're already using Sonos, you'll be able to disconnect. Sonos' multi-room system wasn't strictly impossible without the wired connection to a router before. 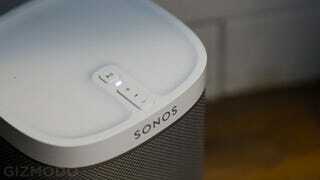 When Sonos first launched, however, the tech wasn't quite to the company's exacting standards. Wireless multi-room audio requires that all of the speakers stay in constant communication to keep the music in sync. It would be pretty distracting if the music your kitchen was playing even fractions of a second off from the music in your living room. Rather than risk problems with reliability, the company opted for a wired solution. The component plugged into your router serves as a central hub for SonosNet, a network that links all of your Sonos speakers together. According to the company, most users won't need that wired connection any more. There are exceptions. If you're using the company's Playbar with a Sub or surround sound speakers, you'll still need a direct connection. What's more, if you're in a particularly tricky space or a very large house, a Bridge will make the system run smoother. To help users in these settings, the company is also rolling out the $100 Boost, a more powerful version of the Bridge. The new wireless setup is comes just as Sonos is getting some serious competition. Imagination Technologies announced a completely wire-free multi-room audio system back in January. Bose, Samsung, and other huge brands now have multi-room systems, too. And you can expect even more, since DTS' Play-Fi tech lets basically any company get into the wireless game without developing their own system.